Designed to help you relax whether you are indoors or outdoors, the four-bedroom Bord De Mer Villa has a large pool you can enjoy every afternoon, as well as it’s own private path to St. Jean Beach. The villas West Indies style greets you with a welcoming feel few others can offer. Located just a short distance from the area grocery store, restaurants, and the town of Gustavia, Bord De Mer Villa offers you privacy without sacrificing location. 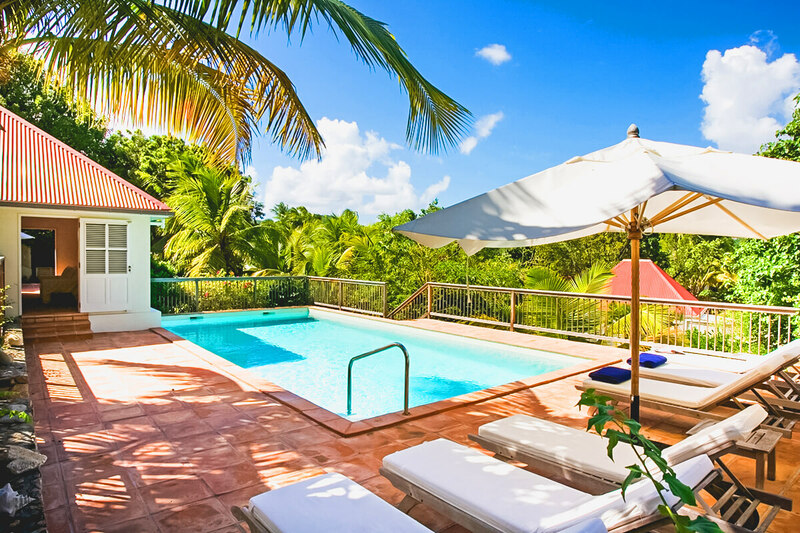 Villa Bord de Mer is surrounded by tropical flora and a one-minute walk from St. Jean Beach. This elegant and private home is perfect for family vacations. The private pool and deck are bathed in constant sunshine, and large umbrellas shade the loungers and dining table. A private path leads guests down to St. Jean Beach, which offers stand-up paddle boarding, snorkeling, and restaurants. The living area features plush couches and high ceilings that echo the open view outside. The dining table sits between the living room and kitchen, which features stainless steel appliances and every amenity needed to whip up gourmet meals. Each air-conditioned bedroom sits in its own bungalow with a private bathroom. The master bedroom offers a four-poster king-sized bed and sitting area. The second and third bedroom offers two twin beds that can be converted into a king. The fourth and final bedroom offers a four-poster king-sized bed and seating. Bord de Mer has its own private beach, and is also minutes away from celebrity-favorite Nikki Beach, eclectic boutiques, and global cuisine.